Behind me I hear the clicking of gears, the pulsing whir of the derailleur, and then they whoosh past me in a hazy whir of carbon fiber and aluminum. Heather and Bill have just arrived to take me for a ride, and if I want to follow, I am going to have to work much harder than I thought. Throughout this geographical region, there is terrain suited to everyone, from the budding domestique to the neophyte, and the Skylands Cycling Club has rides planned for those on both extremes. Besides racing categories, there are groupings to help riders define the level at which they want to train. For example, most beginners will want to choose "C rides," because they travel at the most laid back pace. "A rides" are the most intense and often subject the rider to varying levels of discomfort. Expert riders tend to push each other to their limits. "B rides" fall somewhere in the middle. A quick perusal of their website enabled me to find a group ride I thought I could handle. Along with members of the Skylands Club, I began my two-wheeled journey through Sussex and Orange (NY) counties. What I found was a landscape that revealed itself as sublimely different than what I had noticed through the windows of my car. Subtlety is endemic to the Skylands Region; on a bicycle such things are detectable. The temperature change in the air as I pass a body of water, the topography and shape of the land I feel intrinsically now that I am moving across it powered only by myself. As children on bikes we were always going somewhere: to town, to the stream to fish, to a friend's house. Only occasionally did we just ride to ride, and I had forgotten what it felt like to bike without a destination in mind. When I met up with Heather and her husband Bill for a tour of the northern reaches of Skylands territory, that is exactly what they prescribed. Heather is relatively new to cycling, but her ascent has been meteoric in local and regional rankings. In little more than a year of competition, the 33 year-old has caught the attention of the U.S. Olympic Development Committee, and rides as a guest for one of the top teams in the country. Most people, even those with athletic backgrounds, pay their dues in the lower categories of racing for a few years before moving to elite levels -- not Heather. Her first race was a time trial in spring of 2004, followed soon after by a road race. Since then, she's taken the Northeast by storm, reeling off victories against much more experienced racers. Bill is typical of most cyclists in the Skylands Club in that his affection for the sport is contagious. He knows cycling in and out. He also knows that some big decisions are in the air for his family because of Heather's newfound prominence in cycling. Both are members of the Skylands Club. Heather credits the club with helping her achieve the level of success she has in such a short time. Since Heather began cycling with Skylands over a year ago, their female racing team has grown to over 10 riders, while their general membership grown to more than 70 since 2002. In addition, USA Cycling voted them the "Best New Club" in 2003. The three of us begin what would be a 25-mile tour of the rural roads of Pine Island, Warwick, and Amity, New York at the Vernon Town Park on Vernon Crossing Road. The two of them run me through a checklist to make sure I have all of the necessary gear: bike specifically built for road travel, helmet, sunglasses, which would function more like a windshield, water or Gatorade (although Heather has been known to bring a bottle of flat Coke with her), energy bar or gel, and of course, a spare tube and pocket-sized pump in case of a flat. We stay north on County Route 517 (map of route) for as little time as possible to avoid the hassle of traffic, and wind through the Glenwood section of Vernon. The landscape was speckled with the ripening orchards of Pochuck Farms climbing hillsides to the northwest, andf expansive horse farms that disappear into the Pochuck Creek . All are buildings that have been magnificently restored to their original grandeur with delicate gardens and expansive and inviting porches. Newport Bridge Road takes us off 517, crossing over the Pochuck Creek, and immediately the mood of our ride changes. Gone are the worries about traffic and road debris; gone are the worries, period. We settle down, our shoulders easing back slightly, a slower rhythm takes over our cadence and we listen to the rush of wind past our helmeted ears. The hamlet of Amity is tucked into these meandering slopes as they lead into the "black dirt" region of Orange County, NY. Approaching town, the magnificent Amity Presbyterian Church, built in 1796, bestrides a knoll to the right. Barns have been converted to artists' studios and homes, and structures that seem to be consumed by a lifetime of vegetation show signs of restoration. I keep pace with Heather and Bill on Newport Bridge Road and course through onto Bloom's Corners Road towards Edenville. Characterized by quaint structures and authentic stonework maintained with impeccable detail, Edenville's late18th Century origins are apparent. Our pace quickens on the road out of town, Orange County Route 41, a two-lane highway. We tuck in behind one another and share the responsibility of taking a turn at the front, cutting the wind for the other two. Wheeler Road approaches on our left and our preference for quiet roads draws us back towards the black dirt region, flanked by alfalfa fields. On Big Island Road, Bill and I lag slightly behind Heather as she begins to work the slight and rolling hills, a landscape ideally suited for training on a bike. The road winds around the southern side of Mt. Eve, reaching its northern slope on a winding descent that greets us with new air heavy with the smell of rich, dark earth. Before us sprawls a scene only found in the black dirt region: symmetrical rows of pale green onion stalks contrasted with the deep loamy black of the earth. From our vantage point, the fields stretch for miles to the north and east, with only Big Island Road cutting across them in front of us. Eventually, we find ourselves back in Amity, headed back to Vernon. Like the terrain, we begin to undulate. Our conversations are terse, our arms and legs glistening under the now early evening sunset. The sky above us has taken to its nightly pastel hues of lavender and orange. Winding through the valley, we eventually land on Route 94 before bearing right on Maple Grange Road. Two quick lefts and we are back at our cars, ending our 2-hour ride. I am amazed at how much there is to enjoy along these little back-country roads. On another early evening I arrive at Woodbourne Park on Berry Road in Wantage to join the club's "B" group on a 20-25 mile jaunt. (map) Our pack of six riders sets out along Route 628 and emerges to cross Route 565 onto Lewisburg Road, lined with large farmhouses and barns, challenging us with hills that begin to turn vicious. 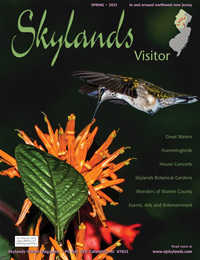 Jeff, the group leader, explains that it is not wholly uncommon for Skylands riders to log thousands of miles per year. "I've put in over 2,600 miles this year alone," he tells me between breaths as we approach the peak of the hill to see Lake Windsor, a private lake community. The sun sits suspended to the left of us shining wondrously on this lake, invoking visions of Adirondack Mountain retreats. 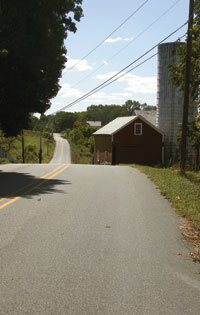 Meadows Road near Cedar Ridge Farm. Along Beaver Run Road, I begin to lose count of the horse farms and riding academies, one seamlessly blending into the other as we approach the village of Lafayette. We veer left onto Meadows Road where we take our first practice sprint of the evening. Cedar Ridge Farm, on the corner of Van Sickle Road and Meadows Road, greets us with the pungent aroma of manure. To escape it's bouquet, an informal rush around the corner sends my speed to the highest level it has been so far. "Going fast", like a kid, brings me back to a youthful precipice that I haven't been to in a while, and I hang onto it out of memory. We pass into Augusta from Lafayette, emerging again on Beaver Run and crossing Route 15 onto Decker Road. Along the way we intersect with the Sussex Branch Trail, a popular mountain biking and hiking trail stretching 21 miles from Mt. Olive, near Interstate Route 80, north to Branchville. Up ahead around a few bends, we pass through the peaceful town of Branchville, far removed from its days as a busy railroad hub. Leaving town, the most precipitous climb of the day winds underneath our wheels. Switching to our "granny gears", we spread out as each rider takes the hill at his or her own pace. My legs have disintegrated, and if not for the immediate downhill, I may perish. 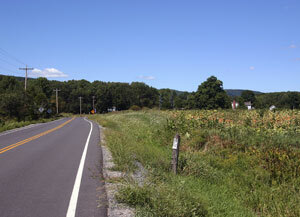 Route 519, although a county route, is magnificent to ride on. Freshly paved with little or no debris on the roadside, it feels as though my bike is being pulled along as we head into Beemerville. From just outside of town, the riders practice their sprinting skills by angling with one another for perfect position and then one of them breaks out and the others chase them down. The finish is directly in front of Space Farms Zoo and Museum. With Beemerville behind us, our ride winds down, and we head back to Woodbourne Park. In two trips, the members of Skylands Cycling Club have shown me the majesty of this land, so steeped in agrarian roots. It defies even the classification found in guides written for this region. By pedaling through this land, open to the elements and the temperaments of its topography, I have experienced its pastoral splendor and reveled in its purity and innocence. I notice that time, although it may not stand still, adjusts to my pace. Minutes become hours that I don't notice, and around every turn a new story emerges.